Indian Creek, Comanche County, Texas. 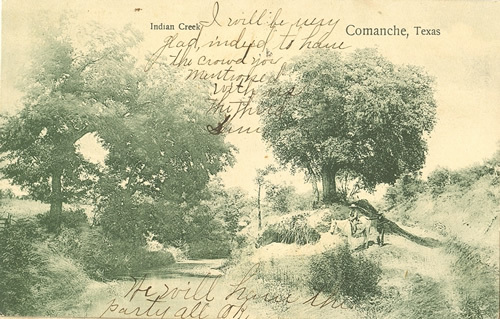 The Indian Creek community (Comanche County) was originally a civilian fort built in 1851, as a defense against the Indians. It was one of the first towns in Comanche County. The name of the settlement came from the steep-sloped creek that rises a mile north of present-day highway 67 / 377 and runs east for approx. 25 miles passing through the city of Comanche and Indian Creek (community) before joining the Leon River, 4 miles N of Gustine. A cemetery is shown on TxDoT maps of Comanche County, although it is unnamed.